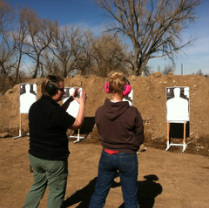 "This [Women's CCW] class was amazing! I had shot a handgun once right before the class and felt nowhere prepared or educated. This class made me feel like I actually knew what I was doing and that I had the knowledge to shoot and handle a handgun. The instruction was great and taught the basic handling in a way that was not overwhelming. I left with the education to pass on to my child and a new experience to share with my husband. Thank you so much for this empowerment!!!" --S.H. "I can't tell you how nice it was to learn about handguns in an all female class with a female instructor. I felt comfortable to ask any questions that I had without any sort of intimidation. I walked away feeling that I can safely load, unload, and fire the handgun that is in my home. Great women, great class!" --K.L. "I really enjoyed my class and learned more in those couple hours then I had hoped to! It was a fun, relaxed atmosphere in which I discovered all the practical aspects of having a concealed carry. I would HIGHLY recommend this to anyone who wants to be comfortable carrying or even just gain more knowledge about guns and firearms. Thanks for putting on a great class!" 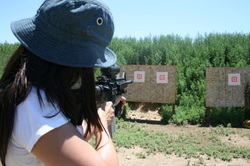 --J.C.
"I thoroughly enjoyed the [CCW] class and encourage all people to take the class. Even if you don’t choose to carry, the class offers excellent training and good to know information. The instructors are good quality Americans that have a passion to train others to protect themselves and their families." --B.M. "I don't own a gun. But I grew up in a hunting family and have always enjoyed savoring wild game. In the last few years, with government regulation threatening our freedom at every level, I've developed a keen interest in being able to defend myself. I live alone and at 76 I represent "easy pickins'" for any thief or lunatic intruder. When offered the opportunity to renew my relationship with guns I enrolled in [Xodus Group's] Concealed Carry Class to learn about choosing a weapon, knowing the rules of engagement, the responsibilities of gun safety and ownership and how to hone my own firearm skills. It was an informative, hands-on firearm safety class which included a live-fire segment with a variety of pistols. I recommend the class to anyone, especially beginners, who wish to broaden their understanding of the second amendment, learn gun safety and practice target accuracy." --M.M.